Pharmaceuticals: Creams, Gels, Sterile & Non Sterile Ointments and Biotech products. Cosmetics: Cold Creams, Hair Dye Cream, Conditioners, Lotions, Gels, Mascara make-up, Shampoo, Toothpaste. • VFD for Anchor agitators to vary the RPM. • Open top with top entry propeller stirrer. • Close top with bottom or top entry propeller. • The main function are mixing and emulsifying. This in the broader sense means producing very fine emulsions, suspensions, etc featuring excellent homogeneity and thus finally stability of the mixed product. • Jacket have heating & cooling with temperature control with Safety equipment. • Electro polished Pipeline and joints are TC standard for easy opening & re-fixing. • Vacuum system to transfer product from one vessel to another vessel and zero retention in pre phase vessel & inter connecting pipeline. • No Air contamination. / Human contamination Cleaning In Place cycles with validation protocols. (Optional). 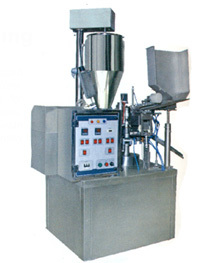 Pharma Systems tube filling machine is reliable, flexible and user friendly to give output of 70 To 80 Tubes per minute. To make machine easy to use and quick change over, special care has been taken. The machine design provides good access for maintenance and give operator excellent visibility at all the major machine functions. Machine is equipped with high accuracy filling systems, provides clean and accurate filling at optimum speed providing high quality and product. The machine is extremely compact. • Simple Mechanism & Operator Friendly. • Combo Model Suitable For Both Aluminium and Lami/Plastic Tubes. • Out Put 70 to 80 Tubes Min - For Double Head M/c.